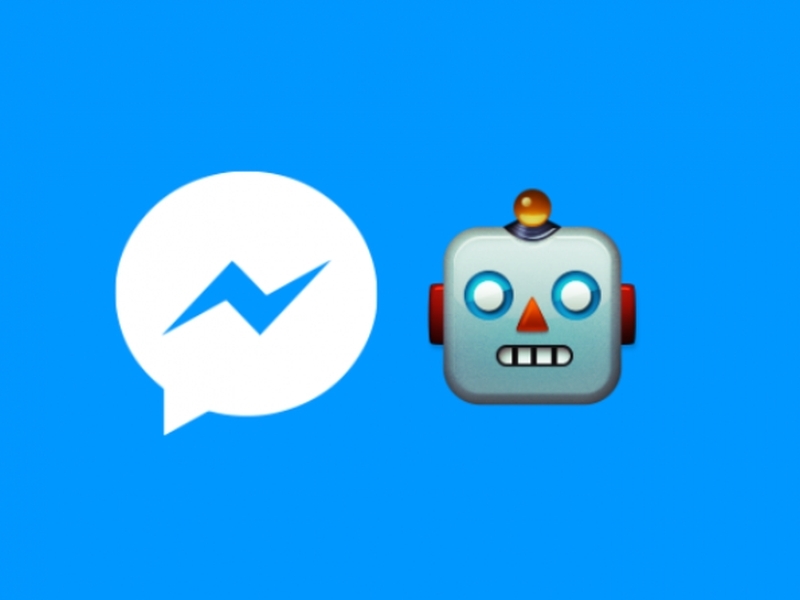 There’s a lot of buzz around the idea of chat bots ever since Facebook built out bots for Messenger, some of it more successful than others. The Messenger platform itself is new and evolving, so it’s not really a surprise that the products that use it are also changing rapidly, with some dying off and new ones come up fairly fast. There is some scepticism around the idea of conversational commerce as the momentum for theWhatsApp of ‘X’ model that built up in 2015 seems to be slowing a little now. At the same time, we’ve come across a number of chat bots that don’t want to replace the apps you’re using, just supplement them to give you information very quickly. The idea is that you don’t always need to launch an app and dive into it to get simple things done – and then, once you’ve figured out what you want, the app is always an option. Need to know when a flight is due? Want to see where a plane is, in real time on the map? Want to find out what the check-in baggage allowance of an airline is? Instalocate helps you answer all these questions quickly and effectively, without needing to load a big app, or carry out multiple Google searches. You can read more about it here, or you can check out Instalocate here. This is a cool Messenger bot that can listen to music and identify it for you, the way Shazam does. How practical is AudioShot? 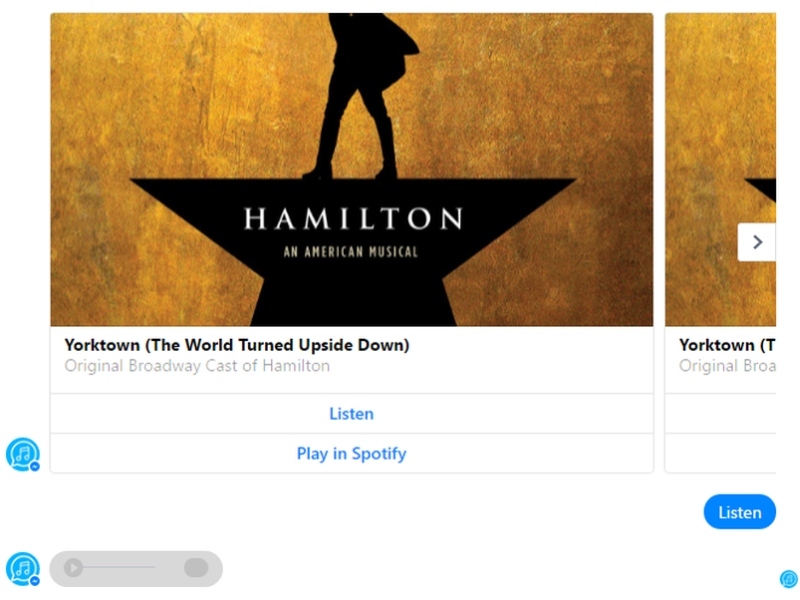 Probably not so much considering that you can identify songs with Google Now and Siri as well, but what we liked about this is that it also works on laptop – you can identify songs from your PC without installing any software, and you can listen to and share snippets of the song as well. This is a really cool bot for book lovers. 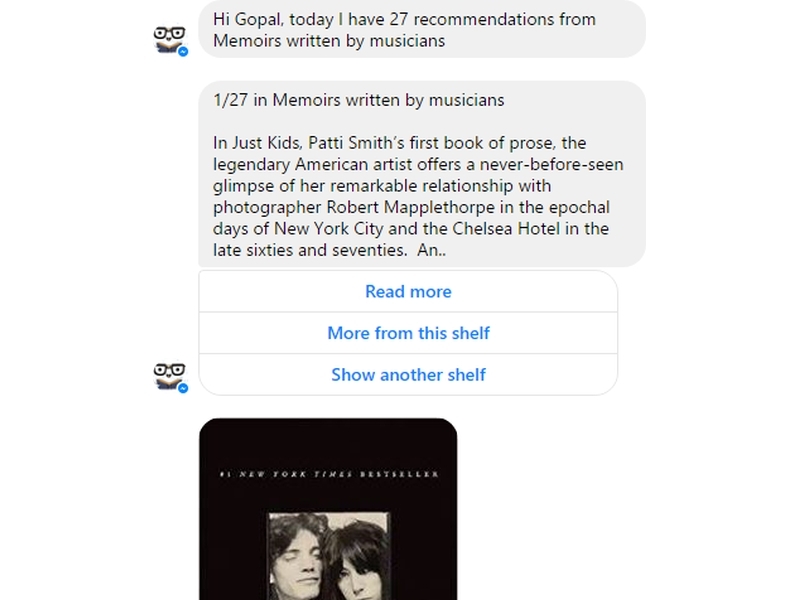 What Shelf Joy does is makes suggestions for books to read, and the lists it draws from – called shelves – are hand curated. This means you’ll have shelves by theme, by genre, and more, and while it’s being recommended through a machine, the final selections come down to human taste. So for example, you can find shelves like Books recommended by Bill Gates, or Science Books for Non-Scientists. What’s missing right now is a way to express your interests and find a relevant shelf; right now, you have to browse through multiple shelves until you find something you like. If you find a book you like, the Bot can take you to Amazon to buy the book in question as well. 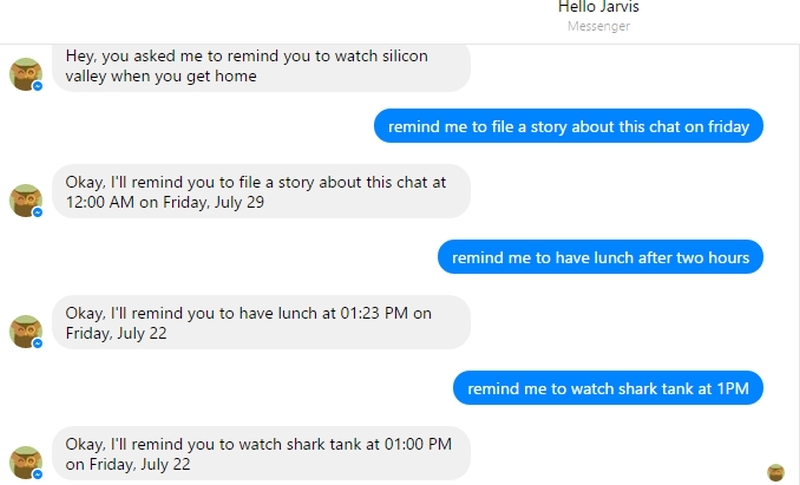 This Messenger bot is useful if you keep Facebook open in a tab all day at work, as it lets you quickly and easily set multiple reminders. 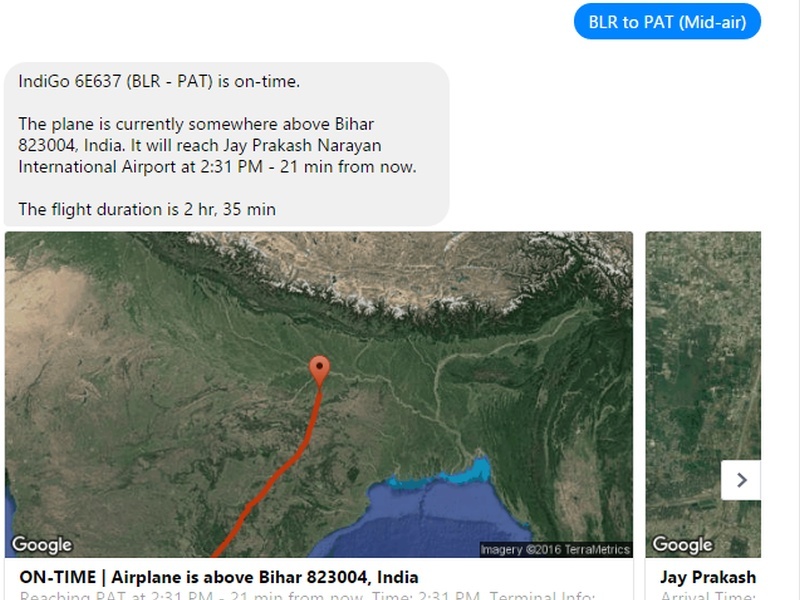 There are a lot of different ways in which you can accomplish this – Google Now means that you can just type in a reminder in the Chrome omnibar, while Slack users can have Slackbot set a reminder; Jarvis is another way of getting this done, it’s one of those cases where the bot only makes sense if that’s where the user spends most of their time – if that means you, then Jarvis is definitely your friend. 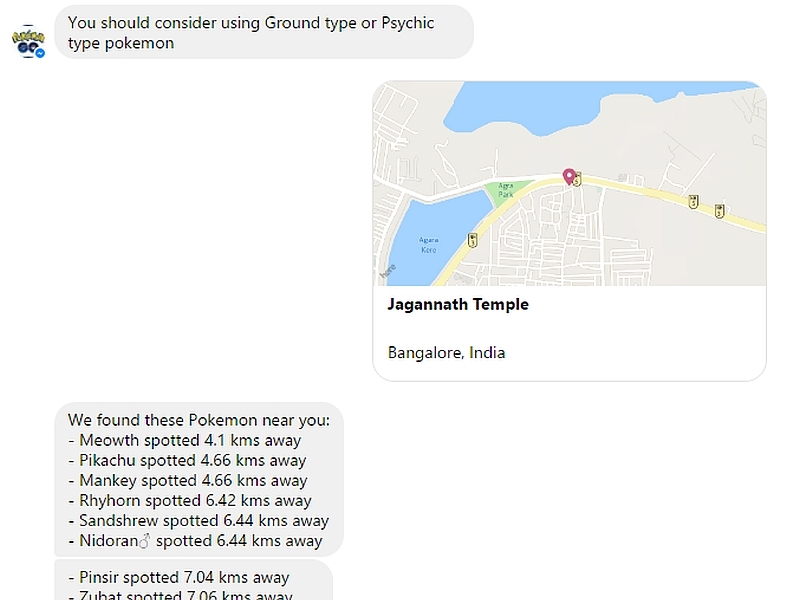 Made using Indian AI startup Morph.ai’s platform, the PokemonGo bot is building a crowdsourced map of Pokemon, for the game Pokemon Go. The way it works is simple – just send your location to the bot followed by the name of a Pokemon, and it’ll be added to the database. If you send just your location, it’ll tell you all the Pokemon that others have reported nearby. You can see a list and map view, and you can also ask for advice in gym battles. Pretty stupid? Sure, but quick and cool too. We didn’t want to blow our own trumpet in the main list, but we think that the Gadgets 360 is really cool. If you want to shop for electronics products online, then the bot can help you find the best deal, and you can also look up reviews, or ask the bot for the best phones under Rs. 10,000. Pretty helpful, we believe. There’s also Quarterly Tax Calculator – it isn’t a Messenger bot but a website where you can quickly and easily chat with the bot to figure out what advance tax you have to pay. This is for the US, so people in other countries might not get much use out of this, but we loved the simplicity of the interface, and the excellent visual design.